These Jasper heli-skiing tours are provided by Robson Helimagic. Click HERE for more information and for reservations. Upon your arrival in Valemount, BC, you will find yourself at the meeting point of three different mountain ranges: the Monashees, the Cariboos and the Rockies. These mountain ranges are just waiting to be explored during your skiing adventure. This area is renowned for its incredible scenery and abundance of light, dry powder snow. With Approximately 1500 square kilometres of high country terrain, you can ski glaciers, open snowbowls and treed runs all in the same day. Picnic lunch is provided and the tour includes four flights (approx. 10,000 vertical feet). Fat skis are available for rent. Multi-day tours and private group tours are available. 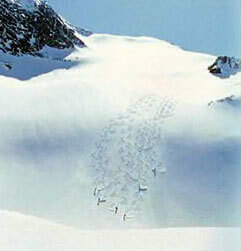 Alternate helicopter adventures include Jasper Heli-Snowshoeing Tours and Cross-country skiing by helicopter. Private packages for up to eight guests with two guides and a dedicated helicopter available.